Remember my last post about the perfect floppy hat? Allright I didn't bought that one, but found a cheap version that come close. This hat is from ebay (search for black floppy hat and you will find it), it's 100% wool and not to much floppy. And of course you see my new black Zara bag, wearing it everyday now. Gave outfit die tas is echt een beauty! Mooi outfit, fan van je tas! Hele toffe outfit, vind je jas erg moo! Hele leuke tas heb je! Toffe look, ben dol op die schoenen! Hele mooie outfit! En wat een prachtige hoed! Leuke outfit, hoed staat je goed! I love the haaaaat. Hat addiction!!!! And I think is perfect with you new chatouche! Hele leuke hoed. Past perfect bij de rest van je outfit. Cool! 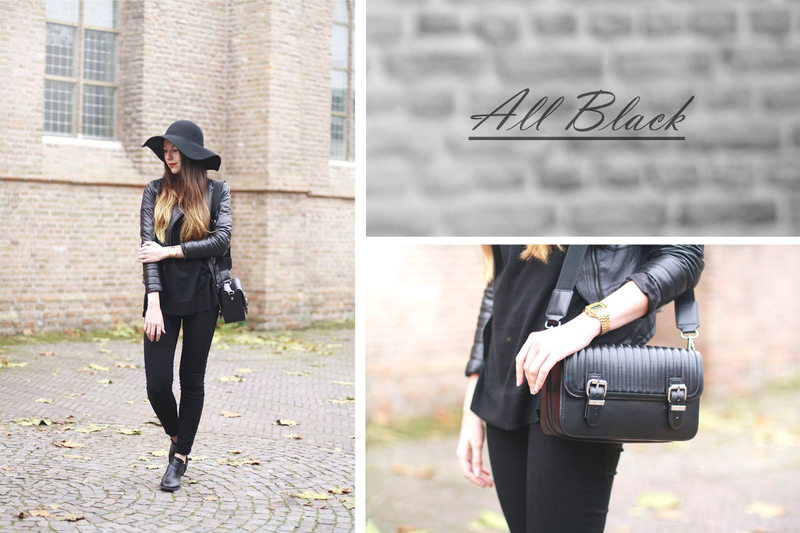 <3 Black is always chic! Liefde voor de hoed en tas! Hele mooie en nette outfit! Die tas is perfect, past overal bij! Hele mooie outfit! En die hoed staat je heel erg leuk! Precies mijn smaak, super leuk! Super gave tas! Ik ben ook fan van de floppy hats... ze maken je outfit altijd veel leuker.